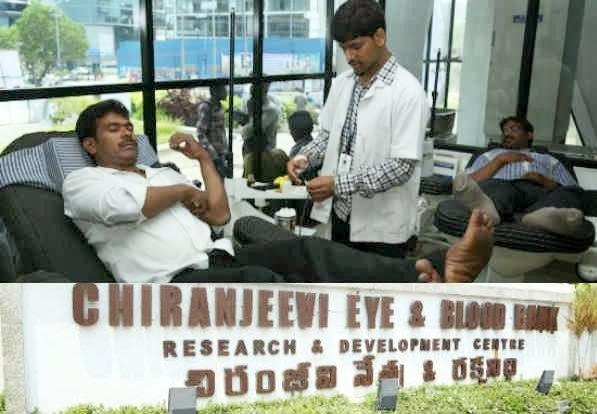 On 2 October 1998, he founded the Chiranjeevi Charitable Trust (CCT), which includes Chiranjeevi Blood and Eye Banks. It is the state's largest recipient of blood and eye donations. The trust has made over 68,000 blood donations and 1,414 eye donations.The Blood Bank of the CCT has helped over 80,000 people and the Eye Bank has helped about 1,000 people in the state of Andhra Pradesh since its opening. Around 350,000 people have pledged their eyes to CCT so far, giving 1600 people eyesight through CCT. CCT has also won the "Best Voluntary Blood Bank Award" by the AP State Government for the past 4 years. On 10 June 2006, the then President of India, Abdul Kalam, inaugurated the Chiranjeevi Charitable Foundation (CCF) at the Jubilee Hills Check Post in Hyderabad. Chiranjeevi Charitable Trust has crossed the one lakh mark in collecting blood and more than 96,000 people have been helped with blood by this blood bank. After allegations made against the Blood Bank and Eye Bank, the state government of AP constituted a high-level committee to look into the allegations. The committee worked under the guidance of the project director of AP State AIDA Control Society, comprising experts from finance and technical fields, verified records pertaining to the collection and disposal of blood samples, blood grouping, screening, sterilisation, medical waste disposal, camps conducted, blood expiry, quality control, store room, record room and purchase of equipment. The blood bank equipments are used in blood donation camps to collect blood and supply in hospitals.